Flu season is here and already making headlines. During the 2017-2018 flu season, it is estimated that more than 80,000 people died from the flu or flu complications. More than 900,000 were hospitalized. These numbers are the highest we've seen in decades. Everyone needs to take steps to protect themselves for this flu season now before it peaks, especially people with asthma. As you prepare to deal with co-workers who come to work sick, kids who bring illnesses home from school or germy public spaces, here are some things you need to know. The flu is a respiratory virus. If you have asthma, you fall into the high-risk category. That means your already inflamed lungs can get even worse when you get the flu. This opens you up to serious complications, like asthma attacks and pneumonia. 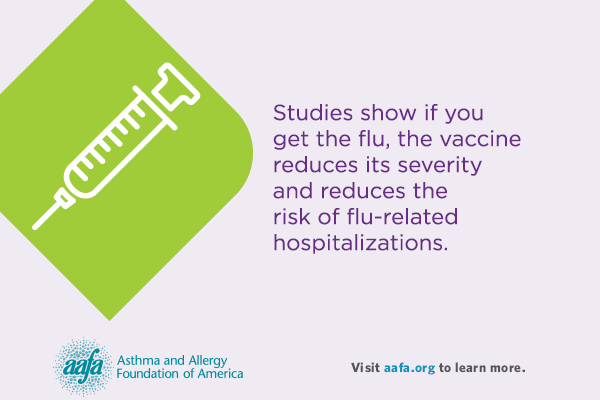 When you get the flu vaccine, remember to get the shot if you have asthma. Even though the nasal spray is available, it is not recommended for people with asthma. Wash your hands often with soap and warm water for 20 seconds, particularly after coughing or sneezing. If you don’t have access to running water, use an alcohol-based hand cleanser. Don’t touch your eyes, nose or mouth. Don’t share makeup, food, dishes or eating utensils. Coughing co-workers? Feverish family members? The flu is a contagious virus that can be spread before a person even has symptoms. If you get the flu or are in close quarters with someone with the flu, contact your asthma care provider right away for treatment whether you have symptoms or not. There are anti-viral treatments that can help lessen flu symptoms if you start them within two days of getting sick. 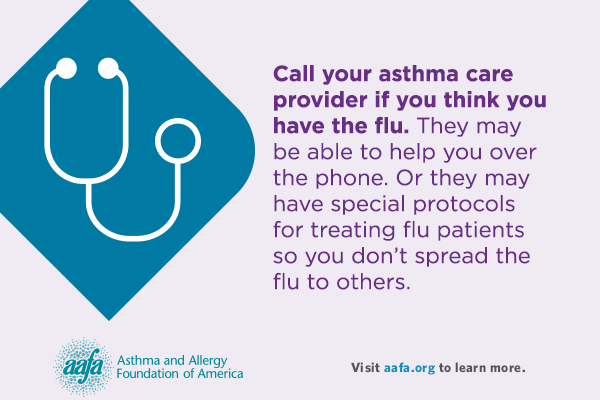 Speaking of contacting your asthma care provider, call first before you walk in. They may be able to help you over the phone or let you know about special protocols they have in place for seeing flu patients. If so, you won’t spread the flu to others if you do have it. And if you don’t, you won’t risk exposing yourself to it. 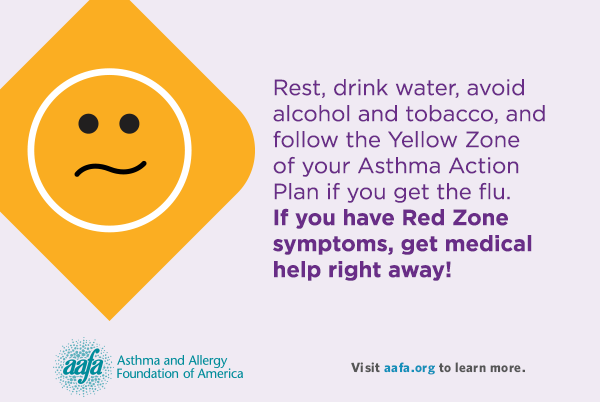 At the first sign of flu symptoms, follow the steps for the Yellow Zone of your Asthma Action Plan. 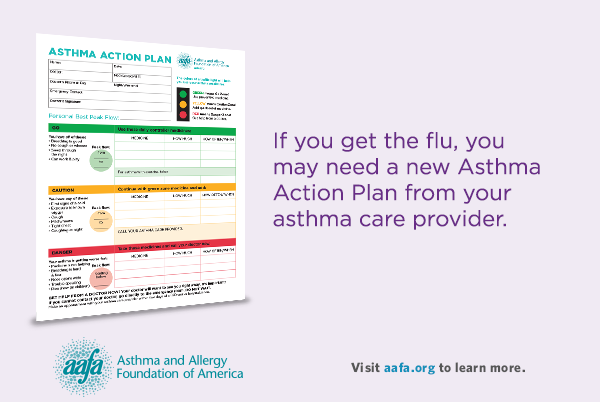 Then when you talk to your asthma care provider, they may give you a new Asthma Action Plan to follow while you are sick. This may involve changing the types of medicines you take and/or the doses and timing of medicines. While you are sick, take care of yourself. Carry your quick-relief medicines with you at all times. (You should keep them with you all the time even if you don’t have the flu.) Rest, drink water and avoid alcohol and tobacco to ease your symptoms. Ask your asthma care provider if they recommend any over-the-counter medicines to relieve symptoms. And make sure you get immediate medical help if you start having Red Zone or emergency flu symptoms. Call your asthma care provider or 911 right away if you have any of these symptoms. Prevention goes a long way during flu season. 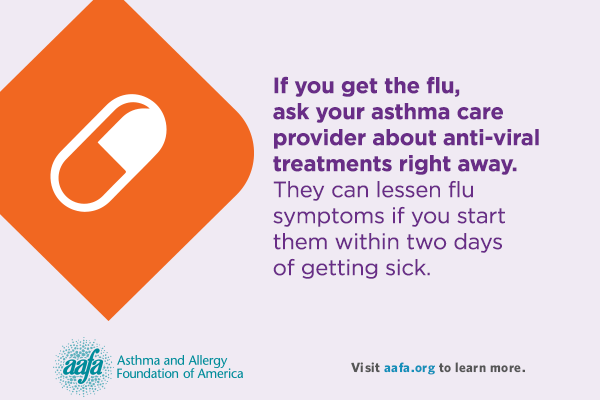 Along with these steps, talk to your asthma care provider now, before flu season peaks, for more information on how you can both work together to prevent the flu and deal with it if you catch it.